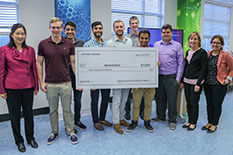 In April, six teams of University of Maryland students competed for $5,000 in scholarship money in the Northrop Grumman Sensing for Autonomous Vehicles Challenge finals held in the Northrop Grumman Collaboration Space on the College Park campus. "The Sensing for Autonomous Vehicles Challenge was designed to help give students familiarity with radar systems," said George Kinchen, Manager, Radar Systems for Northrop Grumman Mission Systems and a UMD alumnus (Electrical and Computer Engineering, 2014). Kinchen administered the challenge in conjunction with Keyla Contreras-Cottin, Project Manager, University Relations, for Northrop Grumman Mission Systems. "What really inspired us to create the challenge is that radar systems are a significant focus of Northrop Grumman in our Maryland campus," Kinchen explained. "From my personal experience as an undergraduate at UMD, I never acquired experience, class-wise, with radar. I wanted to bring some of that experience to students. The end goal was to get some of them to come out and join us in our industry." Approximately 121 students attended the information session for the challenge. Ten teams entered. Six teams made it to the finals. "In the challenge, we asked student teams to use a radar kit to detect a quadcopter drone at different ranges and speeds," Kinchen explained. "We gave them an integrated radar system that they could command using MATLAB® or Python. They then used that kit to detect a small moving object (quadcopter) at different ranges. It's actually a very difficult problem. A lot of groups can use these technologies to accomplish various missions and methods that we are concerned about." Teams had eight weeks to complete the challenge, including spring break. Northrop Grumman contributed one mentor (all volunteers) per two teams, with five mentors overall. Each was a radar systems engineer with at least three years of experience. Steve Mitchell, a lecturer in the Department of Mechanical Engineering at UMD, also mentored teams. Judges for the competition included a Northrop Grumman radar systems engineer with 30 years of experience and Professor Eyad Abed of the Electrical and Computer Engineering and Institute for Systems Research at UMD. Electrical and Computer Engineering major Sahil Sharma won first place, with $3,000 in scholarship prize money. "In class I study a lot of the theory," said Sharma. "It was really cool to get experience working on autonomous systems in real life. I learned a lot about signal processing. It wet my appetite and I am interested in learning more." The mentors offered by Northrop Grumman were valuable in navigating the challenge, according to students who participated. "I learned a great deal from George," Sharma explained. "He held office hours 3-4 times over the the course of the challenge and I went to all of them. He really helped me bridge the gap between theory and actual implementation. His help was critical." For Nikhil Goyal, a senior Electrical and Computer Engineering major and a member of the second-place team, which won $2,000 in scholarship funding, the challenge gave him the desire to enter more competitions. "This was my first engineering competition," Goyal explained. "It was cool to get to play with technology you don't normally get to see. The radar stuff is awesome and complicated. I can't imagine how difficult it is to make a real system. I definitely want to do more." For Sahil, "more" might land him at Northrop Grumman. "I am in contact with several engineers and HR folks," said Sahil. "Although I will be in California this fall doing co-op at Tesla, I am very interested in full-time opportunities with Northrop Grumman."